“Does anyone love their fans as much as Bruce?” That’s the question I posed a few weeks ago when BruceSpringsteen.net posted a “thank you” video to attendees of the Wrecking Ball Tour cut to an unreleased version of Bruce’s cover of “Dream Baby Dream.” Springsteen & I is a new a crowd-sourced documentary about the emotional connection fans feel to Springsteen. 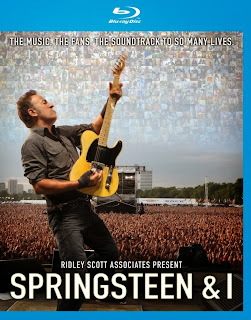 Purposefully, the film opens with with a clip of Springsteen in concert, telling the crowd that he can’t do it without their support. Springsteen & I is equal parts love letter to Springsteen and love letter to Springsteen’s fans. When the filmmakers announced their call for submissions last November, inviting the entire world to upload video footage describing their connection to Bruce, I uploaded a video of my wife and I having our first dance to “Happy.” A year later, the finished film is so perfect that I’m only a little sad we didn’t make the cut. The footage of fans’ first-person professions of love is intermingled with a healthy proportion of Springsteen performance footage from different venues and decades. Fans of all ages, races, ethnicities and nationalities are featured in the film. Included in the footage are monologues, three-word descriptions, visual representations, sprawling dialogues, and more. Many of the submissions are charmingly unpolished. Credit goes to the filmmakers that they don’t shy away from displaying a few submissions that teeter on the edge of unhealthy obsession. Out of the tales, the live concert recollections are definitely the most powerful. I felt ridiculous, but I found myself choking back tears throughout the film. Forget any sentimental Oscar-bait coming out later this year; Springsteen & I is the true tearjerker of 2013. Well, at least for the Springsteen indoctrinated. I’m not sure how non-fans or casual fans would respond to this film – and I’d be fascinated to hear their reactions. Springsteen & I isn’t a life-changing experience. If you’re watching the film, chances are that Bruce Springsteen has already changed your life. My own memories of concert experiences came flooding back to me throughout the film… Unexpectedly scoring day-of tickets to his first night at the Meadowlands on the Working on a Dream tour and being closer to Bruce than I ever imagined. Taking my Mom to see her first ever Springsteen concert. Watching Bruce blow out candles on his 63rd birthday at 2:00 in the morning after a three-hour weather delay. The ecstatic embrace my wife and I felt in Louisville when we heard “Rosalita” performed live together for the first time. 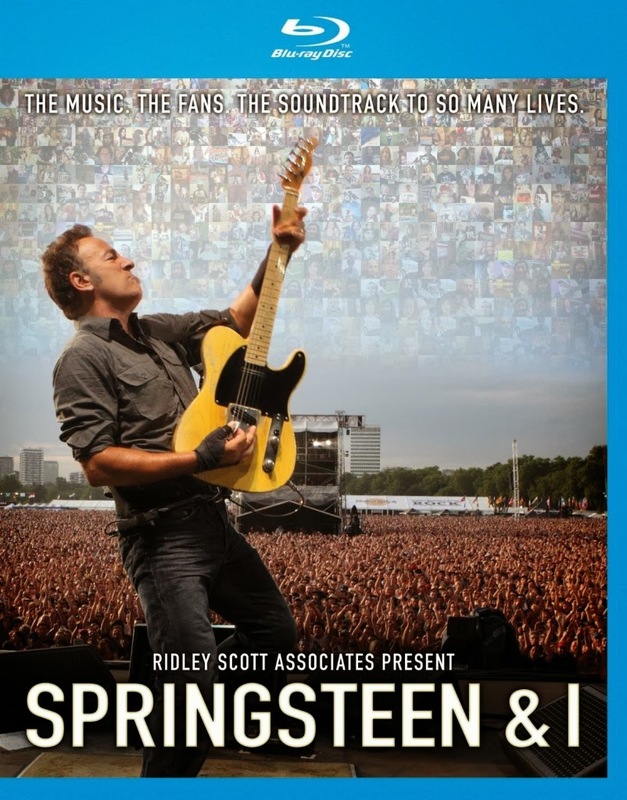 I’m still sad that I wasn’t able to see Springsteen & I in the movie theater to experience the communal atmosphere that accompanies those concert memories, but seeing it on this stunning Blu-ray is a great consolation. The bonus features include 30+ minutes of concert footage from Hard Rock Calling 2012, which is worth the price of the Blu-ray alone. The performances include a stripped-down, tear-inducing version of “Thunder Road” (introduced by Bruce as the first song he ever played on British soil) and the infamous duet with Paul McCartney on “Twist & Shout” (in all its uninterrupted glory). Between this and the Hard Rock Calling 2009 Blu-ray, I’ve vowed that if he ever plays Hyde Park again, I need to find a way to go see him there in person. Also included are four uncut fan submissions. Each one is beautiful and artistic in its own way. My favorite is by Rogerio from Brazil. It details his odyssey to see Springsteen in concert through the use of stop-animation. The final special feature involves a few of the lucky fans featured in the movie getting to meet Bruce back-stage after a concert. Bruce interacts with his fans in the kind of personalized, intimate manner you’d imagine based on the many legends of fan-interaction we’ve heard over the years. Springsteen & I is an accomplishment of diligent curating and masterful editing. The right clip in the wrong place could have seriously derailed the film, but the filmmakers never take a misstep. A sequence containing a man in his car crying as he talks about Springsteen easily could have been risible if it had been inserted with less grace. Some of the film’s simplest moments are also its most profound. Early in the film, a young girl states that she likes Bruce Springsteen because he puts so much effort into every song. But my favorite part involved a lovesick young man who brought a sign saying “Hi Bruce, I just got dumped.” Springsteen reads the sign and asks the young man, “What happened?” “She didn’t think I was spending enough time with her,” the young man responds. “You probably weren’t,” Bruce advises before giving the man a hug. And that’s the Springsteen wisdom encapsulated. He offers truthful, sobering commentary, but he also offers compassion and comfort.